BBC News - How exactly do you grit a road? Gritting lorries have been out in force overnight to make the main roads safe for drivers. But it's not just a case of throwing salt over the streets. As a blanket of snow fell on eastern and southern England overnight, thousands of gritting lorries sprinkled the main roads with salt. Their efforts meant traffic kept moving despite the severe weather conditions. But how does gritting work? Although it's called grit, what is used on the roads is actually rock salt, which lowers the freezing point of moisture on the road surface, so it stops ice forming and causes existing ice or snow to melt. Timing is everything, says John Greenfield, highways manager at Harrow Council in north London, where 185 tonnes of salt have been laid since Thursday afternoon. The first coat was at 3pm, before the rush-hour, again at 9pm, then 1am and 5am. "If you go too early, you waste it, because it lands on a dry road and is blown away by the displaced air as vehicles drive past. "Ideally it goes down on a damp surface and starts to stick, but if you are too late the surface is already frozen, which means drivers are on a dangerous surface and the salt has to work harder to be effective. HOW DO GRITTERS KNOW WHEN TO ACT? "And in London there is no point going out in the middle of rush-hour because if the traffic isn't moving then neither is the gritter." Harrow's six gritting routes - its main roads used by public transport - are covered by its six vehicles in about 90 minutes, while footpaths and pavements are done by hand, by road-sweepers and cleaners. Thursday's first coat prevented ice forming when the snow fell at about 6pm, averting a rush-hour freeze, says Mr Greenfield, who has worked right through the night. But it needed topping up several times. "You can't rely on the same salt and expect it to work indefinitely. The laws of physics don't work like that. It gets diluted and diluted and diluted, to a point where it doesn't work any more and you have to top it up again." The salt is sprayed out of the back of gritters, usually symmetrically along the width, although drivers can alter the width and the angle of delivery according to the kind of road and the conditions. In a light frost, they might spread about 10g of salt per square metre, but in snow it could be as much as 40g because more melting is required. One of the key problems with gritting is that a lack of traffic can make it less effective, says Mark Bryant of EFP Gritting, which works on commercial properties nationwide. "The real frustration and difficulty with any gritting is that the salt goes down and it's hygroscopic which means that it attracts moisture and it only becomes activated when it's 'trafficked'. So when it's driven over and grinds down and mixes with the moisture it attracts from around it, it becomes brine, a salty water. That's what you're ideally striving for because when it's brine that is most effective. "When you watch the motorway, they are putting down salt that's activated very quickly but where streets or properties sit idle all night or the occasional person walks on it, it's much harder to get the same result. "But it's still effective because putting salt down will prevent big sheets of ice forming." EFP usually uses pure salt, rather than rock salt, because companies don't want the brown gritty stuff coming into their buildings from the car parks or entrance paths. So how do gritters know when to go out? Ideally they do a first precautionary grit before the first snowfall, so they need to know when sub-zero temperatures have been forecast. Air temperatures are irrelevant because there can be a few degrees Celsius difference between the road surface and air temperature. 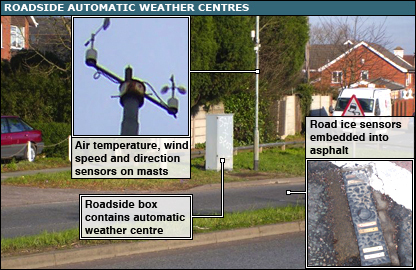 Some councils have their own sensory devices on the road surfaces, and even GPS devices (see diagram below) to predict conditions. But boroughs like Harrow use the Met Office, which has its own sensors and gives a four-hourly forecast.